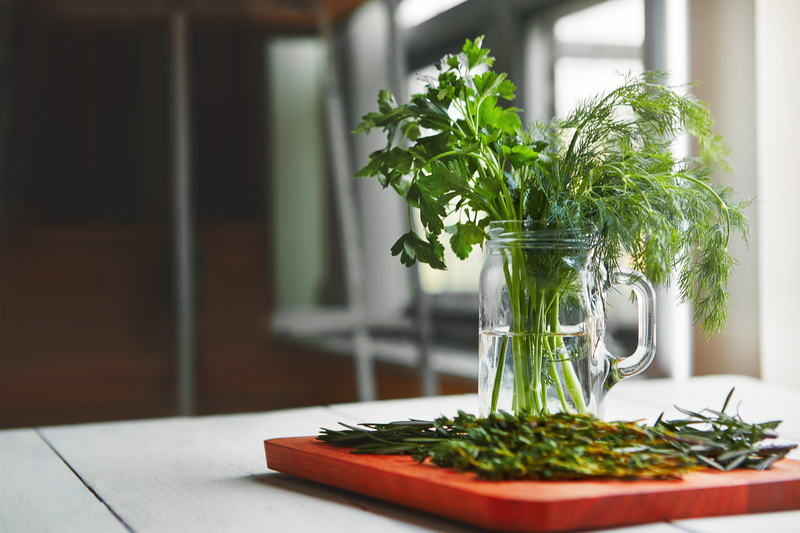 Fresh herbs are an amazing way to add flavor and freshness to virtually any meal – with very little effort. But if you’ve ever purchased a beautiful bunch of parsley just to find a wilted, soggy mess in your crisper drawer a few days later, you know it’s got different storage needs than heartier produce. Our tip? Take a page out of your florists book and treat them like a fresh bouquet. Fill a large mason jar or wide mouthed vase with water and pop in your herbs, stems down, making sure that none of the leaves are in the water. Florist fridges are set at a higher temperature than the one in your kitchen, so to ensure your greens don’t dry out, tent it loosely with a plastic bag. This will extend the life of herbs, scallions, and even asparagus for up to two weeks. We hope you’ll give this game changing storage method a try, and use it as a great reason to always have fresh herbs on hand!